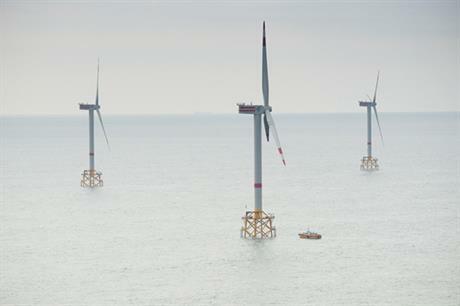 BELGIUM: C-Power has officially opened its 325MW Thornton Bank offshore wind farm, in the Belgian North Sea. Belgian prime minister Elio Di Rupo officially opened the 325MW development which is made up of a 30MW first phase and 295MW Thornton Bank 2 and 3, which were completed this summer. It was also announced that Swiss company ABB has completed the commissioning of the alternating-current transmission link for the wind farm, thus connecting the project to the Belgian grid. Turbines were connected through underwater cables to the offshore transformer station, which will increase the voltage to be fed into the mainland grid at the Slijkens substation at Bredene, three kilometres inland. The C-Power consortium, which has developed the project, is comprised of DEME, RWE Innogy, EDF Energies Nouvelles, the EU's Marguerite Fund and three Belgian investment vehicles.